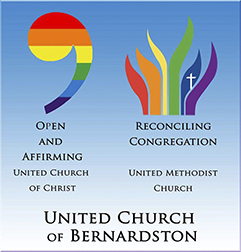 The United Church of Bernardston recently voted to become an Open and Affirming Church (UCC designation) and a Reconciling Ministries Congregation (UMC). This is our statment that ALL of invited and welcomed to be a part of our worshipping community. The United Church of Bernardston is a federated church — a local church with a congregation made up of both United Church of Christ and United Methodist members. The United Church of Bernardston has ministries for children, youth and adults. We are an active church involved in community programs and events throughout the year. Please take a look around the website to learn more about us! We, the people of the United Church of Bernardston, seek to be a community of Christians who celebrate and are receptive to the voice of God. We celebrate the beauty and uniqueness of each expression of God’s diverse family as well as our oneness in Christ. As we seek to live out our mission to live Christ’s compassion and promote justice, healing and wholeness of life, we invite and welcome into our community persons of every gender, sexual orientation, gender identity and expression, mental and physical ability/disability, age, race, nationality, economic and social status, faith background, marital standing, and family structure. We invite all to share in the life, leadership, ministry, fellowship, missions, worship, sacraments, responsibilities, blessings and joys of our church family as we seek to grow together in faith and love.